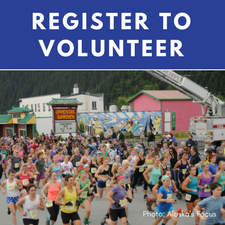 There are two ways to earn a one-time race spot; you can either win one of the Alaska Mountain Runners grand prix races or finish in the top-ten of the previous year’s Mount Marathon Race. Racers who earn a race spot still pay the full race entry fee. The Mount Marathon Race® is part of the Alaska Mountain Runners Grand Prix Race Series. Adult winners of select Grand Prix races may request a one-time invitation to the Mount Marathon Race®. This year’s adult male and female winners of Crazy Lazy, Government Peak, Kal’s Knoya Ridge Run (the longest course run), and Bird Ridge may request an invitation for either the current year or next year. Winners of Matanuska Peak Challenge and Alyeska Mountain Run (Pro Division) can request an invitation for next year. Winners of races that occur outside the registration period should email mmr@seward.com for registration instructions. If a petitioner places in the top-ten of the race, they earn another one-year invite to the next Mount Marathon Race®. Use the online Earned Race Spot Form (available only during the registration period). Select a volunteer opportunity. If you do not meet your volunteer commitment, you may be disqualified from future request. If an applicant does not receive notice of receipt for their online form, the applicant’s should promptly follow up. Those who request an earned-race-spot will first be considered as a lottery applicant. If the applicant is not selected through the lottery process, the applicant will be entered as an earned-race-spot runner. Earned Race Spot applications may only be submitted during the registration period: March 1st - March 31st.